The inadvertent transfer of harmful aquatic organisms in a vessel’s ballast water has been determined to have caused a significant adverse impact to many of the world’s coastal regions. Ballast water discharge typically contains a variety of biological materials, including plants, animals, viruses, and bacteria that can cause extensive ecological and economic damage to aquatic ecosystems. The international maritime community, with the support of the International Maritime Organization (IMO) has developed several new regulations to help prevent the introduction of unwanted organisms. However, competent maritime authorities have a very limited capability to monitor vessel’s compliance to this rule. Without Satellite AIS data, authorities are often left with little to no information to link a probable culprit to the incident. 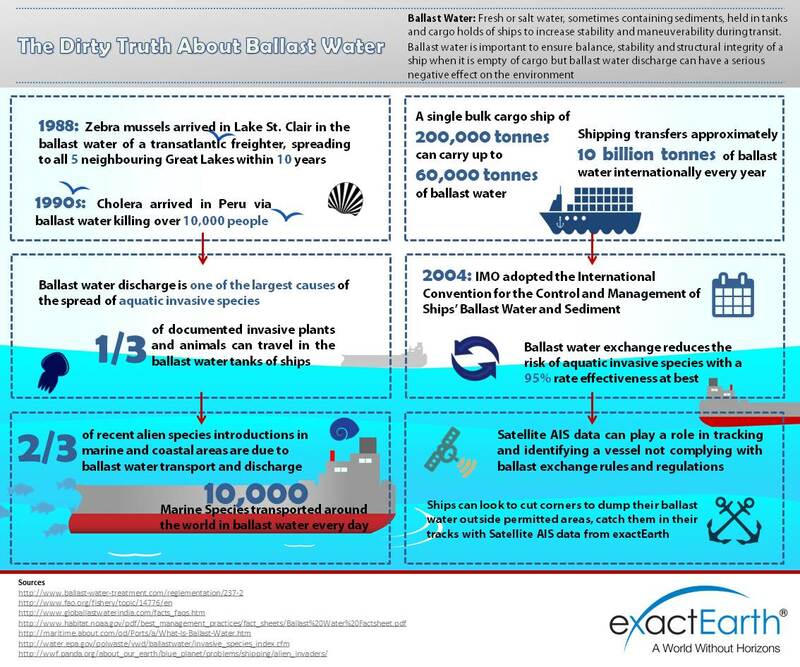 We've put together an infographic that illustrates the impacts of ballast water discharge and why it's so important to monitor vessels' compliance to ballast water exchange in the designated areas for marine environment protection. Our oceans are regularly victim to pollution caused by oil slicks and the dumping of rubbish resulting from accidents and illegal activities. Nearly half of the pollution at sea is caused by ships’ accidental or deliberate discharge of crude oil and other refined products. Combining these traditional pollutants with the atmospheric effects of shipping emissions, vessels have a globally substantial impact on our ocean environment. What role can Satellite AIS play in monitoring these pollution incidents or even better, preventing them from happening?